1. Introduction : Korea Advance Nano-Materials Co, Ltd is nano-materials research & producter group, size range external dimension in the nanoscale from approximately o.1 nm to 100 nm, Nano-Materials with structured in the nanoscale have unique charecterical electronic, optical, chamical, phygical, or mechanical properties. therefore Nano-materials are coming into us using in electronics, green energy, bio-medical & madicine, foods & agricultures, healthcare, textiles & clouths, robotic & automatics, IT & computing, from industry manufacturing system to being human’s lives. 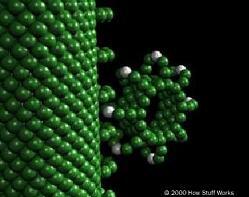 Nanomaterials has the potential to radically change our would. 2. Business : Future advanced Nano-Matertals Research and Producting Company. 1). CNT, Graphene, Fullerene & Carbon allotropes , Polymer,Thinfilm,Ceramics, nanopowders & Crystals composites. 3). Magnetics, Optics, Photonics & Plasmonics, Electronic Nanoma terials and Molecular nanostructures. 4). Organic & Inorganic, Hybrid material and nanocomposites. 5). Synthesis, Nanofabrication, Characterization, Functionalization, materials and nanoprocessing & nanomanu facturing equipment. 6). Applications in the industries : for Electronics, Semiconductor, Transister, Displays, Bio-Medicine and Medical, Green energy and Storage Systems, AI, IoT, VR, AR, Smart Factory, Home and smart City, Nano-Sensor, furthemore cosmetics, smartphone, Robots, Automobile, Constructures, Foods, Agricultures, and Textiles. Graphene is a single, tightly packed layer of carbon atoms infrom of a hexagonal honeycomb lattices and a combination of graphite and suffix-one, it has one layer of carbon, which is just an atom thick. 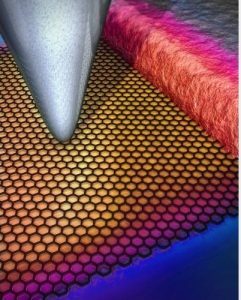 Graphene is allotrope of carbon in the form of a two-dimensional, atomic-scale, hexagonal lattice in which one atom forms each vertex. Graphene has unwittingly produced small quantities for centuries through the use of pencils and other similar applications of graphite. In simple terms,known. Other notable properties of graphene are its graphene is a thin layer of pure carbon; it is a single, tightly packed layer of carbon atoms that are bonded together in a hexagonal honeycomb lattice. In more complex terms, it is an allotrope of carbon in the structure of a plane of sp2 bonded atoms with a molecule bond length of 0.142 nanometers. It is the thinnest compound known to man at one atom thick, the lightest material known, the strongest compound discovered, the best conductor of heat at room temperature and also the best conductor of electricity unique levels of light absorption at πα ≈ 2.3% of white light, and its potential suitability for use in spin transport. Furthemore it exhibits remakable electrical conductivity and heat resistance. it’s widely used in various applications, such as sensors, energy storage, battery, display, IT, smart-phone, wearable & Flaxible, bio-medicine & madicals, electronics, RFID, touch screens, solra cell,s and more.. Carbon nanotube essentially a one-atom thick layer of grapite, The carbon atoms are densely packed and arranged in a 2-dimensional, hexagonal pattern called a “benzene ring”, carbon allotropes, just like diamond and graphite,Carbon nanotubes are allotropes of carbon with a cylindrical Nano structure. Carbon nanotubes are long hollow structures and have mechanical, electrical, thermal, optical and chemical properties and these nanotubes are constructed with length to diameter ratio of 132,000,000:1. 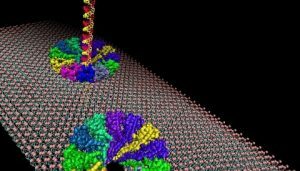 Single walled carbon nanotubes are being used as a platform for investigating surface-protein and protein-protein binding and also to develop highly specific electronic biomolecule detectors. The scheme combined with the sensitivity of nanotube electronic devices provides highly specific electronic sensors for detecting clinically important biomolecules like antibodies associated with human autoimmune disease. Carbon nanotubes are being developed to clean up oil spill. Carbon nanotubes can be used as the pores in membranes to run reverse osmosis desalination plants. 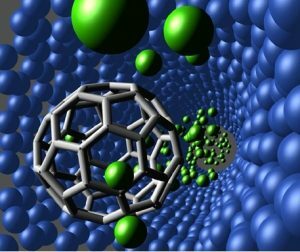 Water molecules pass through the smoother walls of carbon nanotubes more easily than through other types of nanopores, which requires less power. Carbon Nanotubes compounds are used in electronic packaging to meet electrostatic discharges (ESD) and high cleanliness requirements.